FEATURES * The polarographic type oxygen probe with an incorpo- rated Temp. sensor, high precision measurement for Dissolved Oxygen(DO), Oxygen in air(O2) & Temp. measurement. * Heavy duty dissolved oxygen probe, probe head can connect with BOD bottle. * Automatic Temp. compensation from 0 to 50 ℃ for sensor probe. * Build in " % SALT " & " Mountain Height " compensation adjustment button. * Microprocessor circuit. * Records Maximum, Minimum value. 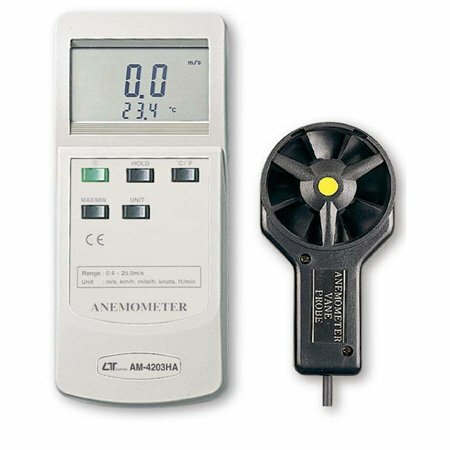 FEATURES * Thermal anemometer, available for very low air velocity measurement. * Slim probe, ideal for grilles and diffusers. * Combination of hot wire and standard thermistor, deliver rapid and precise measurements even at low air velocity. * Heavy duty & compact housing case. * Records Maximum and Minimum readings with recall. * Data hold. * Multi-functions for air flow measurement : m/s, km/h, ft/min, knots. mile/h. * Build in temperature ℃, ℉ measurement. * Thermistor sensor for Temp. measurement, fast response time. * Deluxe hard carrying case. FEATURES * Light sensor used the exclusive photo diode & color correction filter, spectrum meet C.I.E. standard. * Sensor cosine correction factor meet standard. * Wide range measurement both for Lux & Foot Candle units. * Four lighting type selection, Tungsten, Fluorescent, Sodium or Mercury light source. * Zero adjustment by push button. * Microprocessor circuit. * Large LCD display. * Heavy duty & compact case. * Records Maximum, Minimum and Average readings. * Data hold. * Auto power off saves battery life. * Separate Light Sensor allows user to measure the light at an optimum position.